This week’s reflection point: We all know that the Internet is the world’s best tool—right at our fingertips—to transform our lives and improve our businesses. But the web is also the world’s biggest distraction, and one of the worst enemies of productivity. Do you leverage the web to its full potential? 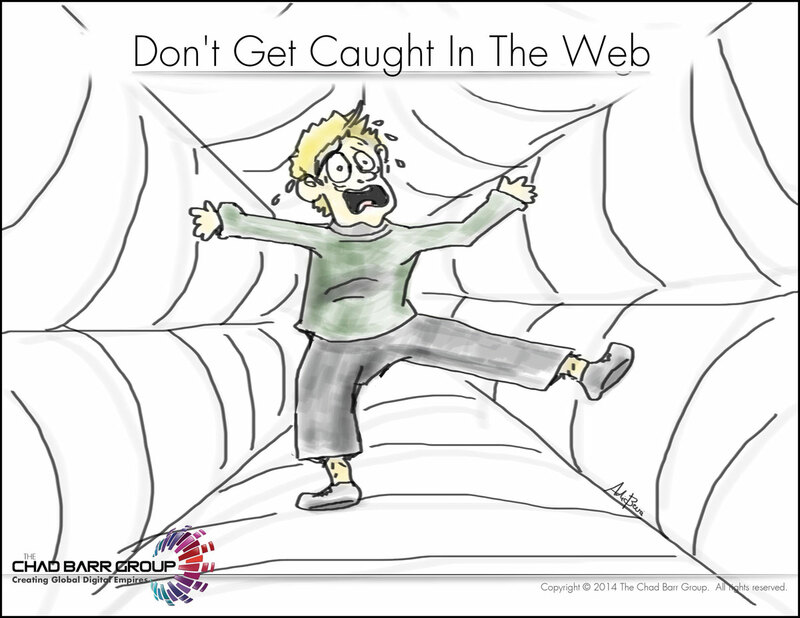 Or are you one of the scores of people “caught” in the web, mostly distracted by it rather than empowered by it? If you think of yourself as a fly for a moment, the metaphor is incredibly apt: The worst thing that can ever happen to a fly is to get caught in a spider’s web. It’s all over at that point—the fly is done. The same is true of getting caught in the web of Internet distraction. Hypnotized by the mindless pull of surfing the web for entertaining memes on Facebook, Twitter, and your favorite blogs, you quickly become stuck. Soon, you have ADD to the highest power. You can waste weeks of your time aimlessly surfing the web—the hours add up like you wouldn’t believe! So how can you avoid becoming an online couch potato, and instead use the web in positive, productive, and empowering ways for your business? In simple terms, you need to take control of your life. Face the reality that the web has a “dark side”—the side that compels you to compulsively check social media, at all hours of the day—and admit that you need to actively resist its pull. You must set aside time each day dedicated to creating and delivering value to your customers. That time should be sacred to you. The dark side of the web shouldn’t be allowed near it. Set time limits for web use. The first step to solving any problem is first recognizing the problem. If you know that you tend to get sucked into the web vortex at certain times of the day, then you must create specific time limits to help you avoid it. You can allot yourself a pocket of time each day—after the workday ends, or during lunch—when you can quickly check social media or keep tabs on your favorite bloggers. But besides that, commit to only using the web for business reasons, seeking out new ways to improve your company or your services online. Focus exclusively on goals. When you sit down at your computer in the morning, you should be able to answer one question: What’s my goal in going online right now? If you can’t answer that question, then you’ll find yourself getting stuck in the web of distraction. The key is to focus exclusively on specific goals while you’re online, so you can maximize your time spend on the web and stay attuned to the essence of what you’re trying to accomplish that day. Create digital accountability. Online calendars are an incredible resource for leveraging the web and avoiding distraction. Respect your calendar and hold yourself accountable to what it says. Your calendar should be a guiding light for you, every day. Instead of writing vague reminders for appointments or meetings, write specific, doable goals that you are committed to accomplishing within a certain span of time. Instead of writing “Work on book today,” try “Write the first 2 chapters of my book before lunchtime today.” By wording your tasks in powerful ways, you are more likely to gold yourself accountable to your digital calendar and avoid distraction online. How can you improve the way you interact with the web? Get started now—and watch your productivity soar. This week’s tip: Don’t get caught in the online web of distractions and mindless entertainment. Instead, leverage the web of business tools and opportunities that can transform your business and refocus your productivity.